Three hours of recording, stereo I/O, and much more! Possibly Eddie’s most notable piece of equipment is his Boss RC-30 Looping Pedal. Sheeran uses the RC-30 in most of his live performances and he’s probably the most recognised looper in the UK right now. Roland themselves believe that Mr. Sheeran is in fact “A master of looping on the cusp of greatness.” In addition to his concerts, Sheeran has used the Boss RC-30 in a number of videos, for the likes of SBTV, such as his “remix” of 'You Need Me, I Don’t Need You', which currently has over 5.5m hits on YouTube. The RC-30 has made an appearance in many other videos including 'Wayfaring Stranger' and 'Small Bump'. Featuring two synchronised stereo tracks, each independently controllable with volume faders and track select buttons and an auto-recording feature that starts recording the moment you begin playing/singing there’s no wonder why countless artists are climbing on board this loop train. The RC-30 comes with a great line-up of creative looping effects built-in, including pitch bend, step phaser, sweep filter and tempo delay. Plug in your microphone through the XLR connection with an option of Phantom Power for condenser mics; with the RC-30 you’re options are always open. 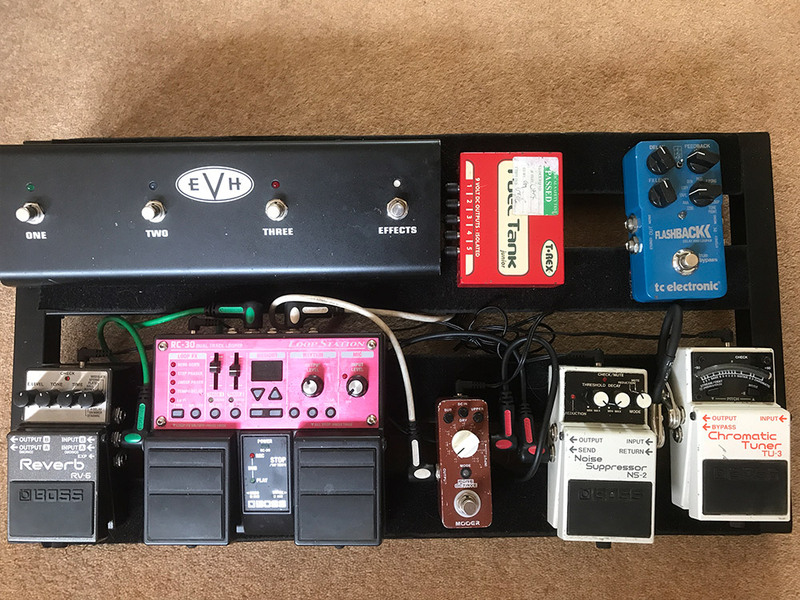 You can see a close up of Yannis' board with this pedal on the top left of the picture [here](http://www.effectsbay.com/wp-content/uploads/2013/04/foals-yannis-philippakis-holy-fire-pedal-board.png), and a shot of it in the video. "After 15 years of using exactly the same pedal board, I am finally ripping it up and starting again. Same idea, but using the @roland_us RC30 looper plus some of their great #fx pedals with beautiful big fat pads that I can trigger without even looking down! It's just the beginning, but exciting (and scary!!) to learn new gear." Really nice loop pedal ! The pedal was used during her Music Box tour. In this photo, Bryndis' pedalboard is visible, which includes the Boss RC-30 loop station. It is not the RC-20XL model because there aren't any buttons on the left side of the pedal. > So what I’ll do is play parts, loop them and then play over them… which has gone disastrously wrong at times. But that’s part of live music, you know? No one expects everything to be perfect, in fact I quite like the weird sounds you get when it goes weird. At 23:20 minute mark, Vile is seen setting up the Boss RC-30 loop station. "On the ground I have a bunch of pedals: the BCM Brian May, a whiteface Rat reissue, a Menatone Blue Collar overdrive, a Fulltone Plimsoul, a Line 6 M9, a Fulltone Clyde wah, a Boss RC-30 looper and the TC Flashback delay – but that's the one you can buy only through Pro Guitar Shop.com. They call it the Alter Ego. I also have the Strymon El Capistan tape echo." The Boss RC-30 looper is used by Lindsey Buckingham with background vocals and a little bit of guitar for a few acoustic songs as published by Premier Guitar. A Boss RC-30 Loop Station can be seen in this live picture of Pall Jenkins. Jason Wade's Boss RC-30 Loop Station can be seen on his pedalboard, at 0:29 in this video. Yorn posted this picture of his pedals in May 2015 on Instagram. You can clearly spot a Boss RC-30 in there. According to Premier Guitar's article, Franklin uses the Boss RC-30 loop station pedal. "Pedalboard: Boss TU tuner Boss noise suppressor Maxon OD808 Boss RC-30"
"Remándola desde abajo los efectos: Afinador Pitch Black, Shaker Vibrato y Hall Reverb TC Electronics, Blogger Fuzz EHX, Whammy Digitech, Micro Pog EHX, Super Octave BOSS, Bass Synth EHX, Dragon Distorsion Cluster, Envelope Filter Micro QTron EHX, Phaser Small Stone EHX, Booster Maza Fx, y Loop Station RC-30 BOSS…"
"What about the RC-30 Loopstation you got recently? I don’t know what’s going to come of it. It’s a new toy. Freddie uses this sort of stuff so I’m playing catch up." "I’ve got another loop station, it’s like an RC-30, from like…"
Photo taken during Tiny Moving Parts tour with Mom Jeans and Oso Oso in Austin, Texas(Feb 2018). At 5:30 of this weird tv show, Chelsea Wolfe can be seen using a Boss Loop Station for a vocal performance of the song "The Way We Used To"
Brian Kanagaki states in his Tumblr post that Sean uses a "Boss looper pedal". We can see all his pedalboard at 40:48 of the video. He uses this loop station during all the show. In this video Richard Bona talks about his use of loopers, and demonstrates his vocal mastery with the help of an RC-30 loop station. Boss Loop pedal is mentioned in source article. Yvette have Boss' RC-30 Loop Station on her pedalboard. The rc-30 can loop up to 3 hours of 99 tracks. Boss RC-30 appears on his pedalboard for US tour. Taken from his instagram story as of 26/03/18. Video only lasted 24hrs so had to reupload. It is seen at the top left corner of the board, to the left of the Ditto looper. You can see this pedal on 14:25. [Stated @ 5:49] This entire video is dedicated to a showcase of his different software, instruments and material he uses to make his music. Mentioned at 2:30 in this video. A great looping machine. The two pedals are all I need although sometimes I want a little bit more like The RC-300. It might be a little expensive if its your first guitar effect or you're just starting but its well worth it. If you want an older, cheaper thing that is just as functional I recommend checking out the RC-20. I like it for being virtually indestructible and I even sometimes use the built in effects. The mic input is awesome for vocal looping. If you wanna see what you can do with it check out Ed Sheeran. IMO best looping artist out there. Bernhoft too. He isn't as well know but his C'mon talk is epic(uses RC-300). Ed Sheeran's really famous nowadays, specifically in the UK. In fact, once I watched this video where Ed uses a Chewie looper to loop his guitar sounds. Built like a tank. Easy to use once you get the hang of it. A very portable device that can serve as a center of a looper's approach. I use it in tandem with Ableton Live. I've tried several loop stations before I got myself a proper BOSS RC-30 and I never really felt up to the challenge. Now it doesn't even feel like that much of a challenge anymore, cause the RC-30 is really super easy to use and it even corrects your loops if they are a tiny bit out of rhythm! I don't really use the two tracks but I prefer the two pedals to the single pedal of the RC-3 and of course the inputs for microphone and guitar. Once you've wrapped your hand around how to handle this little fella, the world of looping is all yours! I upgraded from RC20-XL. This is a good pedal, 2 Channels, can be used with Mic's and instruments, however it's not that intuitive in my opinion to change channels, looping and dubbing... The usb function is great, however there's no option to increase its hard drive capacity or record in different formats (only .wav supported). One of the best loopers on the market - cheers Ed! Great piece of technology that allows all kinds of music to be uniquely explored. This pedal has given me more freedom as an artist than having a band. I can create my songs on the spot and improvise more freely and as well as this it's easy to use and very worthwhile to ahve in any situation. I highly recommend it. I think that i would like to use this more often, possibly as a busking tool, however, i continually find myself drifting from the looper pedal and into pedals more relevant to a band situation. I liked it to start with but the loops started sounding muddy and muffled. The loop rec/stop/over dub/erase is very easy with the two pedal setup. I did buy this second hand though so may just be a bad egg. mi favorite pedal , ideal for play over my tracks live or demo compositions in my home. A must have for all solo artists! I can't stress how important this pedal is to my work flow. I work a lot with loops, drones, and layers so this pedal is an absolute must for the writing process. I found the RC-20 to get a little muddy when adding more than a few tracks, so the option of having two separate tracks was the idea of someone I'd like to buy tacos for. Hey guys check this out: LOOP PEDAL with "STOP GAP" issue SOLVE Cheers! I saw many acoustic sessions from Ed Sheeran. He is using the pedal very well! I have got a travelguitar and need a looper like this! This is an awesome looper. Loops lots of tracks which can be saved and it lets you to loop over loop over loop (over loop)*1012. The effects are also a lot of fun to tinker with on looped parts. The pedals are easy to use and the whole thing is very durable. The volume sliders for the two seperate tracks are also really good, I find sometimes certain looped items may be too loud or I'd like to gradually increase the volume so the volume sliders are really nice. nothing to say... you can play the whole band just by yourself with this! I recommend this one over the other Boss Loop Pedal. This is all you need when it comes to acoustic shows and great sound. One of my first peddles. Came up with so many ideas with this one. definitely recommend for the creative process! Very easy and many functionnality, looper, drum kit, 2 tracks. love it! I really like the way Ed Sheeran play, so i get this to learn to play like him! I use this A lot for when I have an idea for multiple tracks but I don't want to waste time recording multiple parts just to hear what it sounds like. If I can record and play over multiple tracks in real time, it makes it a lot easier. I love being able to loop guitar AND vocals. It also comes with some effects for the loops. I'd recommend getting an external foot-switch to make it easier to play with in a live setting. Loop the loop, 2-track style. I've only recently purchased this one, but it has certainly proven itself over the basic looper in the POD HD 400. Two tracks makes it SO much easier to perform a full song. I am still trying to work everything out, but it is certainly a handy piece of gear especially for a solo acoustic performer. This device is perfect for the musician that wants to be a one man band. This looper is best used when one has a more advanced knowledge of music theory however, this is by no means necessary to be successful. There are many things this looper can do and learning how to use all of its tools can take a little while. These loopers are incredible and this is my current fave. The RC30 allows you to loop as many tracks as you want. It also let’s you have two loop channels to play with. You can turn them on and off for your performance. The options are truly endless. I’d strongly advise anyone to pick one up if they have the scratch. This pedal can also trigger expression pedals, drum machines and it has drum samples onboard but I prefer making my own. Each to their reach however. You just cannot go wrong with this pedal. In fact, it’s more than a “pedal”, it’s an instrument.